Dr Luis Pires joins our team! 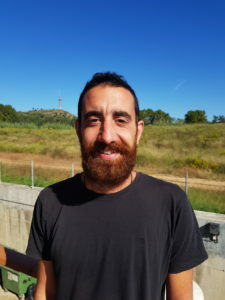 Luis Baptista Pires (Portugal, 1987) received his B.Sc. in Biochemistry from Universidade de Aveiro (2011) and a master degree in Nanotechnology and Material Science at Universitat Autónoma de Barcelona (2013). In 2016 he obtained is PhD title at Catalan Institute of Nanoscience and Nanotechnology (ICN2) – Universitat Autónoma de Barcelona with the thesis untitled: “From nanoparticles to graphene: architecting novel biosensing platforms and devices”. His research is focused on reactive flow-through electrochemical graphene-based membranes, for cathodic and anodic treatment of water contaminants. Welcome Luis!